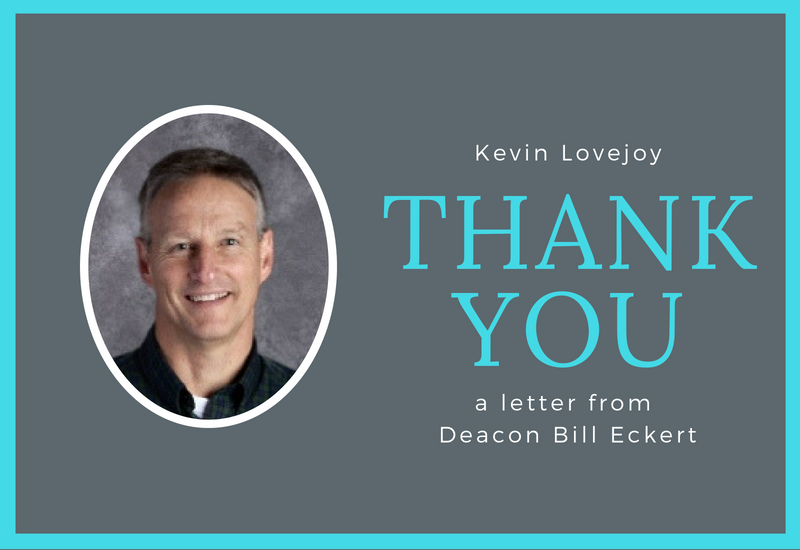 Deacon Bill Eckert shared a message of gratitude regarding Kevin Lovejoy’s leadership over the past three years. 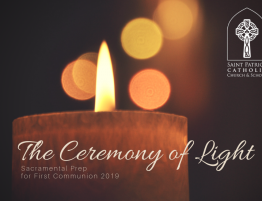 The letter was read at every Mass the weekend of June 23 – 24, 2018. Missed it? Read it now. Share it with a friend. Give Kevin a heart-felt pat on the back when you see him at Mass. Three years ago, we were at a turning point in our parish. Fr. Seamus was retiring, and there were no priests ready to step into the role of pastor here at St. Pat’s. Archbishop Sartain considered the alternatives and decided to try a model that was a bit scary for some of us. He chose to assign Kevin Lovejoy as our Pastoral Coordinator. In essence, Kevin took on all the roles of a pastor except sacramental duties. While Fr. Jerry, Fr. John, Fr. Lamanna, and our other Jesuit fathers cared for our sacramental needs, Kevin took on the spiritual, emotional, physical, and financial job of a pastor. And he did it well. We owe him a huge debt of gratitude that cannot be repaid in a few words at the end of Mass. It would have been understandable if Kevin had just marked time over the past three years, waiting for a new pastor. Instead, Kevin rose to the challenge of empowering the laity of our parish to take on new roles of leadership and responsibility. We have developed a vibrancy that is essential as we greet our new pastor. Kevin is handing over a healthy and lively parish in a couple weeks to Fr. David Mulholland. For that alone we are thankful. Kevin has also created a wonderful workplace for our parish staff. Under his leadership Kim Ward has become a pastoral associate for Faith Formation; he has hired Laura Dougherty, Sandra Kuharic, Eugene Lao, Allison Verhofstadt, and Christy Johnson to handle pastoral care, liturgy, outreach, youth ministry, and development. And our steady eddies of Michelle Carpenter, Mary Leverson, Amy Waller, Joe & Anna Skillman, Bob McKamey, and so many others have grown in the collaborative, pastoral workplace that Kevin has nurtured. Kevin’s work with Chris Gavin has helped make our school a place of learning and growth for our children and their families. We also want to say a word of gratitude to Kevin’s wife, Lisa. Kevin’s role was more than a job; it was a ministry. And, as a result, Lisa and the family had to really make sacrifices. Late nights and seven-day weeks can put a huge strain on people, and we recognize this sacrifice. Thank you, Lisa, for your support and understanding during challenging times. Kevin isn’t going anywhere. He will now be working for Fr. David, helping to serve the needs of St. Patrick, St. Rita, and Holy Cross. His job will only change a bit, and he will have a good boss in Fr. David. And Lisa, it is our prayer that he will have more time with family. So, on behalf of the entire community of Saint Patrick Catholic Church, we thank you Kevin for your faithful service to God and our parish. 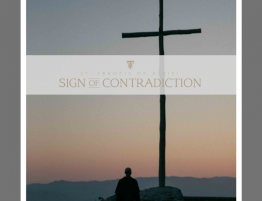 As we continue to grow in our understanding and appreciation of the role of the laity in the Church and especially lay leaders at Saint Patrick Catholic Church, our staff realized that we need to do a better job of recognizing these leaders. That very same weekend that Kevin Lovejoy was recognized for his leadership, we also thanked ministry leaders for what they provide to the parish, and highlight to the parish faith community exactly what these dedicated servant leaders are doing for our faith community within our parish doors, in our parish boundaries and beyond our borders. 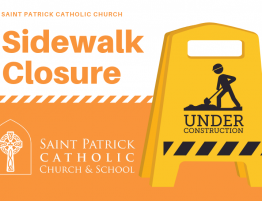 It takes many parts and people to operate a parish, especially a vibrant, active and engaged church the likes Saint Patrick. We take our mission very seriously and as you know, the church of Saint Patrick is the people in the pews. At Saint Patrick Catholic Church we are grateful for parishioners who answer God’s call to serve and who have served for many years ministering to the faith community in our church, within our parish boundaries and beyond those boundaries. 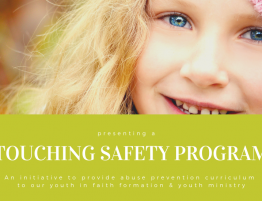 We recognize lay leaders in ministry who have shared their god-given talents— often times over many years to the Saint Patrick Catholic Church faith community. 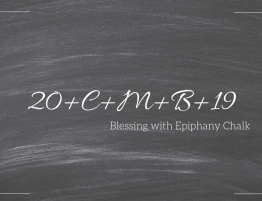 Sometimes a leader hears a call to purse or re-focus and serve the Lord in a different way. We are grateful for their generous gift of talent and support them in the new ways they are called to love the Lord. 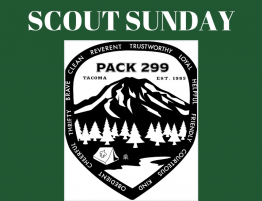 Bev Wombacher for organizing Sunday Social Hour. Emily Keller for her many years of service in the Religious Education program of Faith Formation, Holly Clubb, Jacquie Henrickson and Beth Rahman for hosting First Friday Senior Luncheons for our Women of Wisdom and Men of Maturity. Although not a lay leader, we also recognized Sister Philomena McCarthy— if you have ever been t0 the Parish Center— you have probably bumped into Sister Phil— walking the halls on a rainy day to get her steps in! She is a Dominican Sister— not one of the ones who started Saint Patrick Catholic School, however one of the sisters of that very order that did! The Dominican Sisters recently closed the fundraising office they maintained at the Parish Center. We will miss seeing Sister Phil’s happy smile that we would so very often encounter in the kitchen! 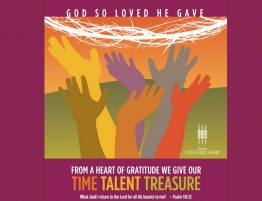 Committing our God-given talents to ministry at Saint Patrick Catholic Church & School is just as important as Stewardship of Time and Stewardship of Treasure. It is how we gratefully give back to God in thanksgiving for the talents He has given us. There are many opportunities within our faith community for us to give back to God using the talents He has so generously bestowed on us. 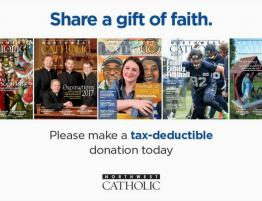 Don’t let your talents “die on the vine.” By giving of your talents, you can help support our parish’s efforts to carry out the mission Christ gave us. If you are feeling called to empty your vessel— the vessel that God has generously filled, email the parish office and let us know which ministry you are feeling called to serve.